Which tattoo artist do I go to? I’ve got my design…who do I see? In my opinion there is no more important part of getting a tattoo than getting the right artist. If you get the right tattooist most of your concerns will evaporate. You will no longer have to worry about infection and disease, no more concerns about them understanding what you want and no more sleepless nights about the quality of the finished work. In fact, even if you’ve chosen the wrong design (which you won’t really know for some time afterwards) at least you’ll know that it’s what you asked for at the time, that it is really well done and your health is unaffected. Yep, getting this bit right is incredibly important. I got this bit wrong with both of my first two tattoos. Right designs, right hygiene levels….just not quite up to the job on getting the job done. I look back now and wonder why I let the same guy do both of my first tattoos. I think I was still a little wet behind the ears. At the time I thought they were both superb, not perfect but superb. Sadly, as time has progressed I look at what I have against what I could have had and I feel a tiny bit of regret. He's going to need more than Red Bull to give him wings. ​I don’t regret the designs, I don’t regret having them I just wish I’d been a little more clued up about how to find the right artist to do the work I wanted. The guy who did them was a really nice guy, keen and enthusiastic and as excited about doing the designs I’d chosen as I was about having them. If he was as talented as he was good to be around I’d have world beating masterpieces. What I have is two tattoos that my current artist has reworked, they are better than they were but, as is the case with some tattoos, they will never be what they were originally supposed to be. Unfortunately, some things just can't be undone. Fast forward a few years. Older, wiser and on direct recommendation of a colleague I found my current artist. The difference is incalculable. She is a incredibly talented artist who appears to read my mind. What ever idea I have she converts into exactly what I wanted…but better. Of course, I provide pictures of what I have in mind but she takes them and creates brilliance. My first visit to her was to have one of my previous tattoos reworked and that was it. I knew this was MY artist from now on. Over the years I have come to trust her to the point where if she thinks something will look better than what I had in mind, I let her do it. She’s always right. I recommend her to anyone and everyone that will listen. She’s a great artist, a great friend and a great tattooist. So what am I saying ? What I’m saying here is simply this, aim to achieve the same relationship with your tattooist that I have with mine. Confidence, trust and understanding….no it’s not marriage, it’s what you need to have between artist and client to get great results. Getting there can take time but it starts the day you start to look for the artist you want to do your tattoo for you. My very own robin...exactly how I envisaged it. A lot of tattoo advice I’ve read starts with finding out with the artist works in sanitary conditions and works from there. I look at it in reverse. If an artist has a huge waiting list, countless people willing to recommend them, many years of experience and a well established business then it stands to reason that this reputation hasn’t been built on the back of sloppy practice and corner cutting. Of course, you should still check everything is as it should be but if everything else adds up, you can be almost certain that the hygiene side of things is going to add up too. I’m not making assumptions, I’m drawing a natural conclusion but I will go into this side of things in more detail later. The first consideration surrounds the style of tattoo you’re going to have, if you don’t know what it’s called check out my page on the various styles of tattoo. You need to find a tattooist that specialises in the area of tattooing that you are going to have. Like all artists tattooists have a style which they excel at, a style they prefer. Just because a tattooist does excellent black and grey work does not mean they’ll be able to do excellent portrait work. Look at it as though you are having a painting commissioned, which in a way is exactly what you’re doing. You’ve decided on a marine theme, you like boats so you think, “I’ll get a painting of boats!” Great! You know what you want but who do you get to paint it? Well, in your head you have a Claude Monet type painting but if you commissioned it from from William Turner (I know, I know Monet was 11 when Turner died…it’s hypothetical) you aren’t going to get what you wanted. I can't wait for my Monet to be done. It's gonna be awesome! Yes, of course it will be quality work but it won’t be right. You’ll get Turner boats, not Monet boats and no amount of appreciating it for what it is will ever compensate for the fact that it isn’t what you had in mind. This was the mistake I made with my first two. Look at the finished work of the artist, there should be examples of the artists work in their shop or on their website. These days Facebook, Instagram, Twitter etc etc are a great way to examine an artists work. The internet is a fantastic resource, you can check out dozens of artists work in the time it would take to check out one back in the days before social media. I can spend hours just browsing the work of artists I’m never likely to meet, it was while doing this that I discovered the work of incredible artists like Dmitriy Samohin, and Nikko Hurtado, among countless others. By doing this you’re not only looking for the artist that will be able to make your tattoo a glorious reality but you’ll learn to detect the good from the bad. You’ll see clean, seemingly continuous lines versus lines which show quite clearly where one ended and another began. You’ll see bright, clear colours and dull, faded tones. You’ll see both the sublime and the ridiculous and eventually you’ll be able to tell if a ridiculous tattoo as been done with sublime skill. Really take your time, finding who you want to do your tattoo. I know what, you’re going to say, “what if he or she works miles away?”, well the most practical option is to find somebody who can do the same style nearer to home. We can’t all travel to Hawaii for a tribal piece like Dwayne Johnson's, to Odessa for some of Dmitriy Samohin’s photo realism or to California for celtic work to be done by Pat Fish but if you look hard enough you may well find somebody within striking distance that can do what you need to be done. It may take some digging, but it will be worth it when you finally strike tattoo artist gold. Of course if you absolutely, positively have to have your tattoo done by one particular artist who lives on the other side of the world, there are ways around it. The most obvious is to travel but perhaps more practical is to find them at a tattoo convention. Many of the top artists travel the world visiting the big conventions, giving you a better chance of getting work by them, without necessarily travelling across the globe to get it. 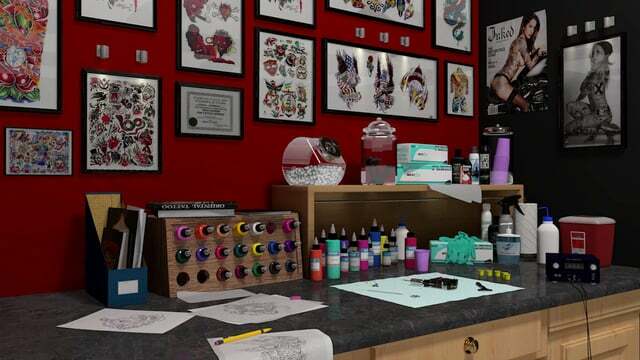 In addition to your own exhaustive searches, there is a new way to find the right tattoo artist for you. i/U Ink is a new website created for the very purpose of helping you to find the right tattooist to create the tattoo you want, hopefully close to you as well. You can search for artists by location, style and name and leave a review of your experience. Read my blog post about i/U Ink here or check it out for yourself via the link below. I found my artist….I think! Ok, so you’ve hunted high and low for your design and hunted just as high and just as low to find an artist, now what? I’m assuming that you checked out the artist's website and social media in the process of finding them, however if you haven’t take a look. See what’s being posted on their Instagram, Facebook, Twitter etc by way of photographs of work, comments and so on. The great thing about social media is that you can benefit from word of mouth recommendations without knowing anyone who has been. Be wary of recommendations on Google+ pages as these are often anonymous and businesses (not just tattooists) will often counterbalance a negative review with two or three reviews from friends, posted purely to slant their Google+ rating. If this is all done and it’s still encouraging you to use that artist, the next thing is to pay them a visit. Personally, the first time I’ve been to see an artist I’ve been thinking of using I’ve gone unannounced. The idea behind this is not necessarily to speak to the artist, they may be busy and may not have time, the idea is to see the shop. When you walk into a tattoo shop it should be clean, in fact it should smell clean (you’ll know what I mean when you walk into one). You may or may not be able to see into the studio itself, depending on the layout of the shop, if you can so much the better. Where it all happens...they just aren't all quite this tidy. A very good question, if you’ve never been in a tattoo shop you’ll need to know what kind of things you should expect to see from a “proper” tattoo shop. If the tattooist is actually working you’ll notice they will be wearing surgical gloves, they could be white or blue or black but whatever colour they are, they should be there. If the tattooist isn’t wearing them while tattooing make an about turn and leave and never return. If the person doing tattoos (I won’t call them an artist in this instance) isn’t wearing gloves they are opening up their client to infection and cross contamination from blood, they are also risking their own health. Their health may not be much of a concern to you but yours certainly should be. I’d also be very curious about what other corner cutting they are prepared to do if they can’t even bother to wear gloves. Ink should be poured from a large bottle into small, disposable ink caps. 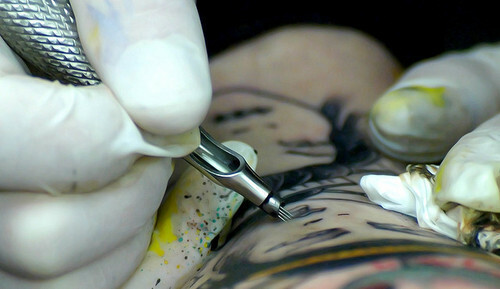 Small, because only a relatively small amount of ink is used during the process of doing a tattoo and disposable because they should be thrown away at the end of your session. Don't drink the contents, it's usually Green Soap. Another thing you should keep an eye out for is an autoclave. An autoclave is a high pressure chamber used for sterilising surgical equipment, when used by a tattooist it is used for the sterilisation of any part of a tattoo machine that is either handled by the tattooist or which comes into contact with the ink. Needles should be disposed of in a hazardous waste container after sterilisation along with the tubes used to house them while attached to the tattoo machine (which should also have been sterilised). 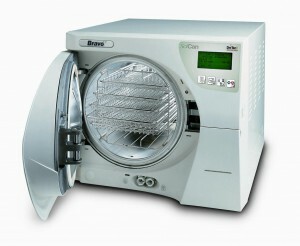 Not a weird microwave..an autoclave. Ink...it's like Crayola for grown-ups. There are all kinds of other bits and pieces you’ll see around the studio, for example spray bottles containing green soap. Green soap is quite simply medical standard soap, used before during and after the tattoo is applied to moisten the client’s skin and to ensure the skin remains sanitary. Green soap is only available from companies that sell medical and tattoo supplies. There’s also things like a hazardous waste containers, sharps bins and cling film. Generally speaking, you’re looking for a clinical level of hygiene, if you wouldn’t be happy getting vaccinated in the room you see, don’t get tattooed there. Right, so there you go. I think there should be enough there to get you set on your way to finding the right person to get your masterpiece underway. Just be patient and take your time, the finished work will be worth the wait. A quick word on tattoo needles. Thanks to an emailed query from one of Tattisfaction's many visitors, I thought I'd add a few words on a tattoo artist's use of tattoo needles. See, I do read this stuff and take it on board. Most tattooists these days will use pre-packed sterile needles to do your tattoo, however this is not a legal requirement. Tattoo needles must be sterile when used and while the common practice is to use a new needle each time they are allowed to re-use needles provided they have been sterilised for re-use. If you have any concerns about which method your chosen tattooist uses ask them about it, they understand that hygiene is of paramount importance and should reassure you whichever way they do it. My first tattooist sterilised his needles (though this was some years ago now) and I came to no harm, though if I'm honest, I'm far more comfortable with the fact that my current tattoo artist uses fresh needles every time. Apologies to anyone who had wondered about this in the past, I'm just so used to seeing pre-packed needles I had genuinely forgotten that once upon a time the common practice was to sterilise and re-use. You can read more here.